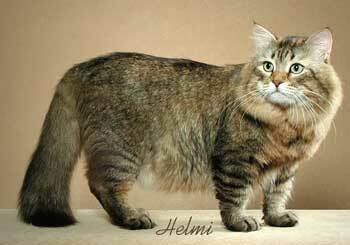 While Siberian Cats are a very old native Russian breed, they are one of the newer breeds in the USA. 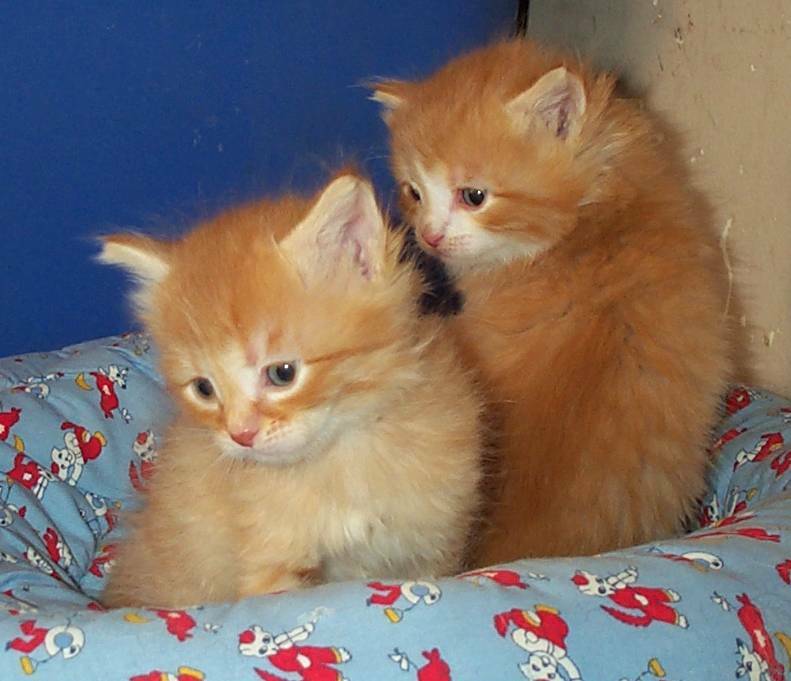 Siberian Cats were first imported to the USA by Elizabeth Terrell in 1990. 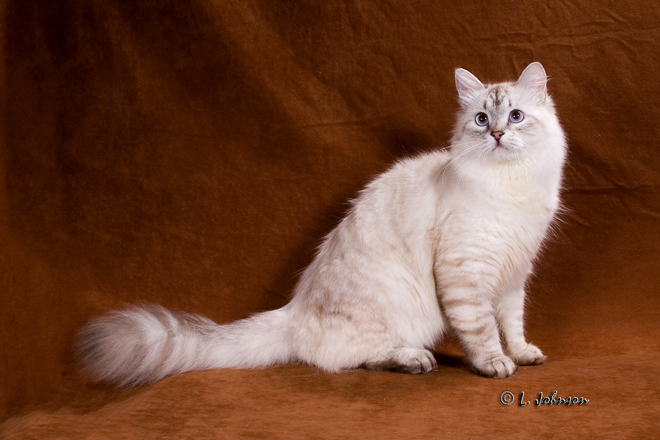 Those first three Siberian Cats came from St. Petersburg, Russia to Baton Rouge, LA. The cats became the beginning of Mrs. Terrell's Starpoint Siberian cattery. The cats are seen below. They are Ofelia, Naina and Kaliostro. I was fortunate to be given Ofelia by Elizabeth Terrell. I showed her and loved her until her death in 2000. 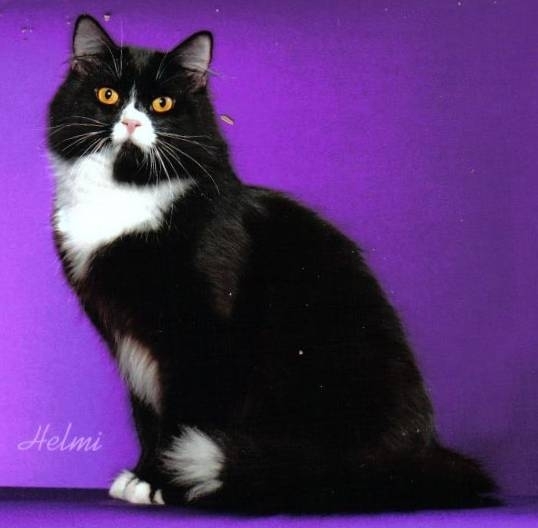 "Deemeek" is the great grandson of Kaliostro, the first Siberian male imported to the USA. 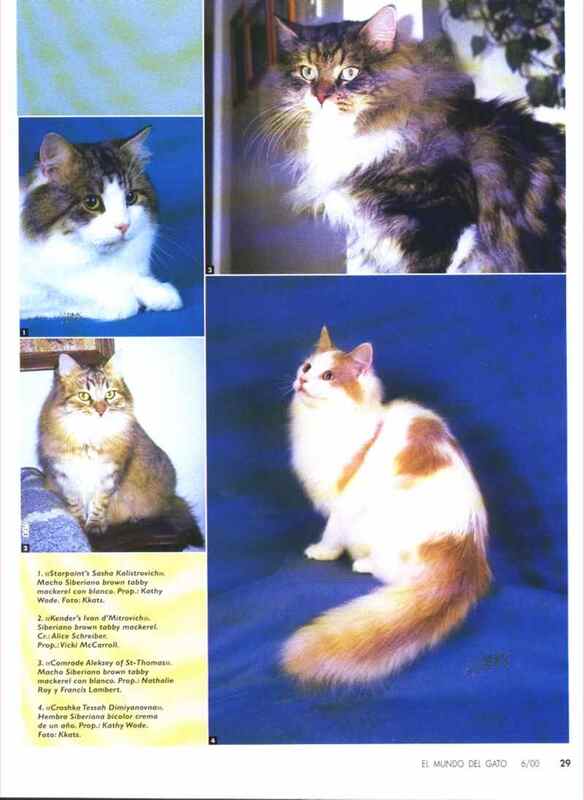 Deemeeknatash was my very first breeding Siberian Cat. He was the beginning of my Sibirskiy Cattery. 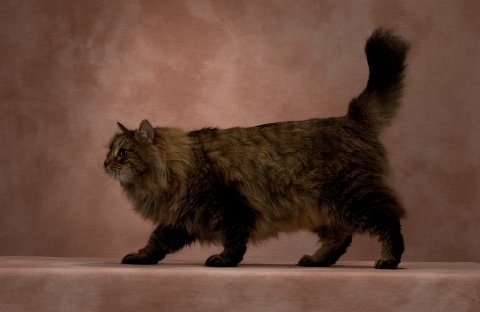 The first Siberian Cat imported from Siberia, Russia was IW SGC Treskuchiy Sibirskiy Moroz Mur. He was imported by TICA Judge Judy Chappetta to New Orleans, LA. 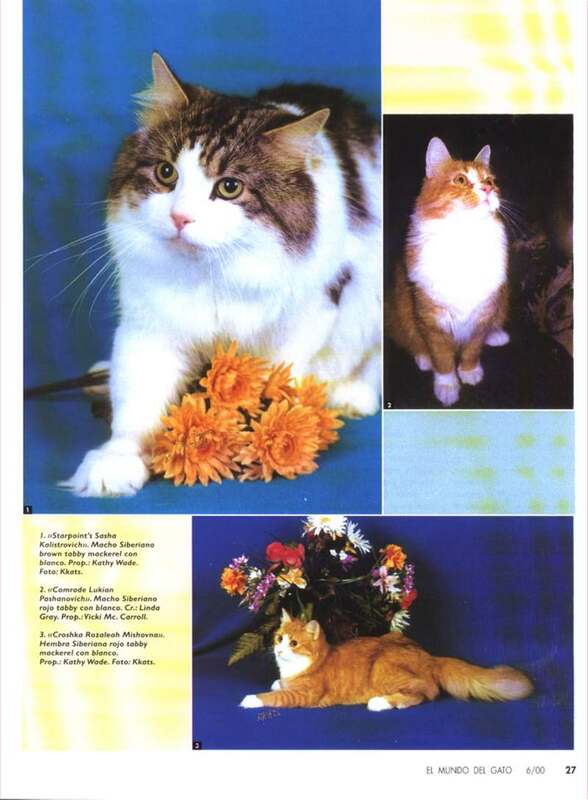 "Irdie" was the first Siberian Cat of the Year in TICA. He was TICA Cat of the Year in 2000. My Deema was "Irdie's" nephew. Deema was the son of Irdie's sister, Ninza. He was the next Siberian male that I added to my cattery. Deema has been featured in Cat Fancy. Irdie's son and my first regional winner.My Angel Man. Russian import and brother of "Irdie"
Dimitri retired from the show ring and became a volunteer for CAAWS's Pet Touch Therapy. featuring Dimitri of Sibirskiy, Bolshoi Viktor of Sibirskiy, and Cooncreole Nosochki Moroz Mur of Sibirskiy. 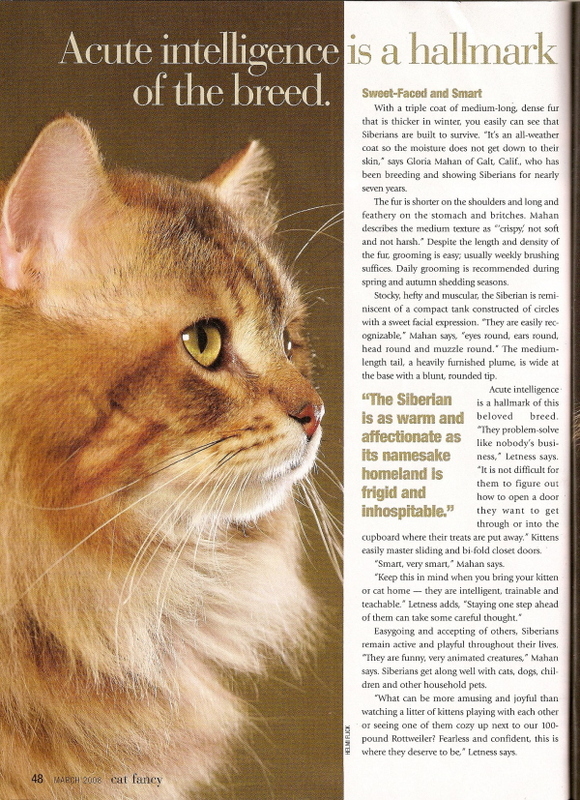 My "Ben" in Cat Fancy magazine article March 2008. El Mundo de Gato, more of my Siberians. 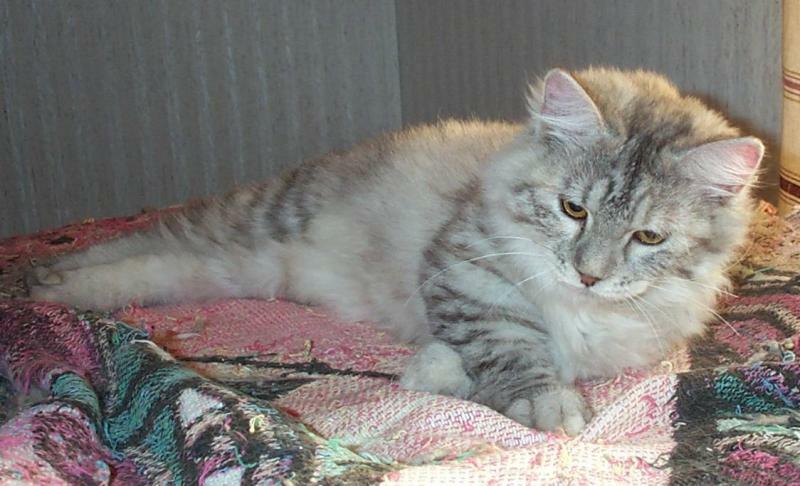 Siberians come in all traditional colors, solids, tabby and colorpoint, lynx point and solid point. 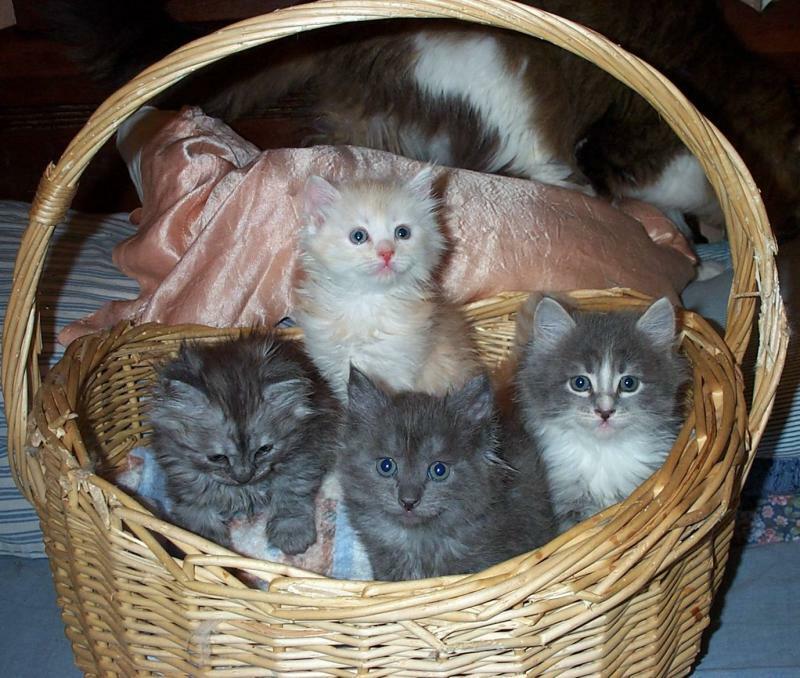 Siberian Cats are a hearty breed that are slow to mature. 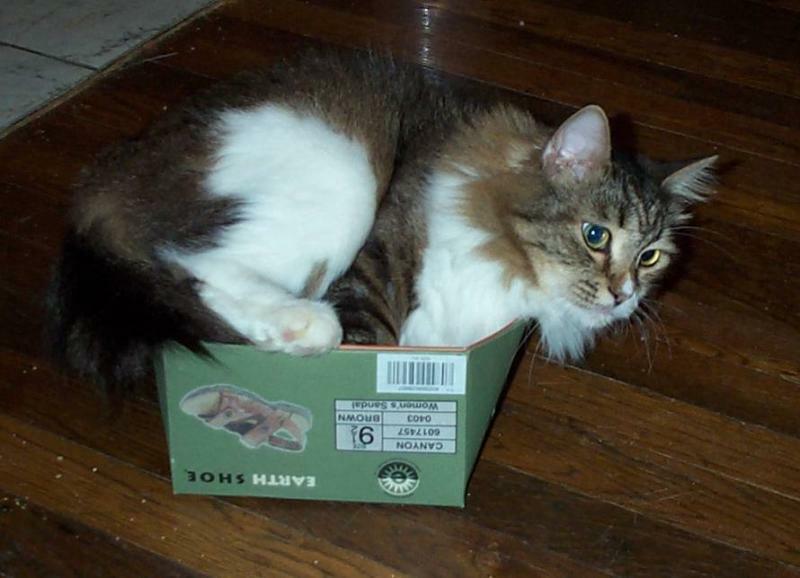 It takes about five years for Siberian Cats to mature. 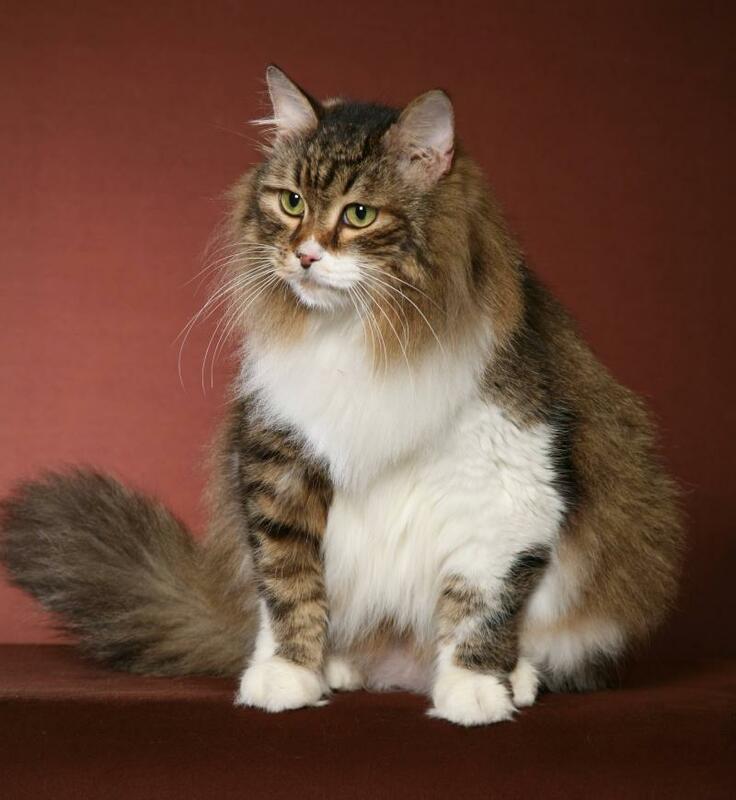 Siberian Cats are rounded cats with no extremes of contours to freeze in the cold Siberian winters. 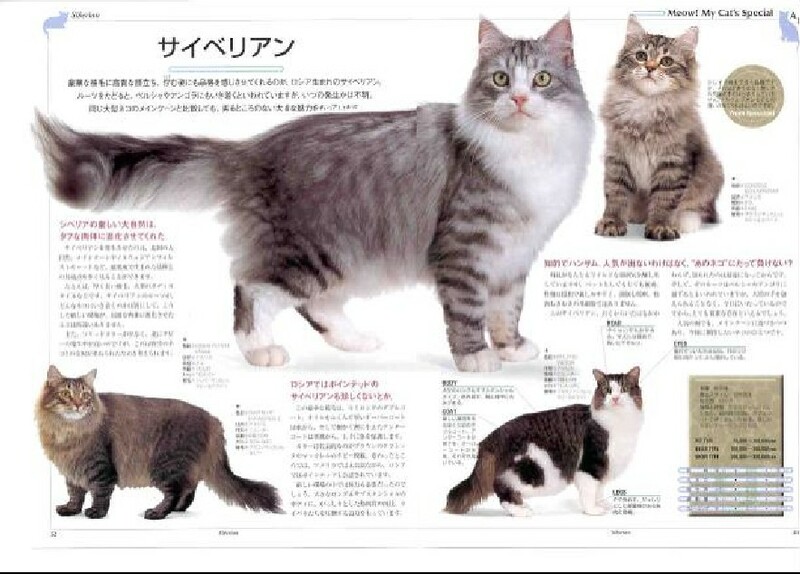 They are semi-long haired with a triple coat and dense fat layer. 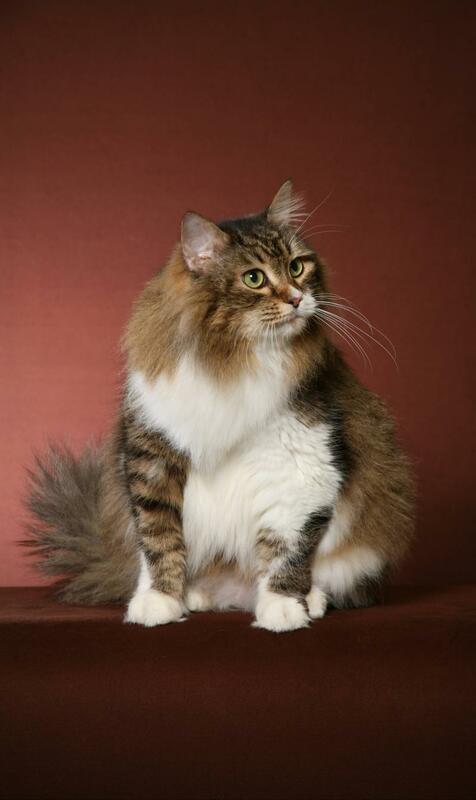 Look at the dense coat and rounded body on this Siberian Cat. The Siberian is broad chested with a short neck and a 55-gallon barrel torso. The ears of a Siberian tilt forward slightly and have rounded tips. The ears are set more to the side of the head than the top-one to one-and-one-half ear width apart. The eyes are rounded and set with the outer conrner tilted toward the base of the ear. 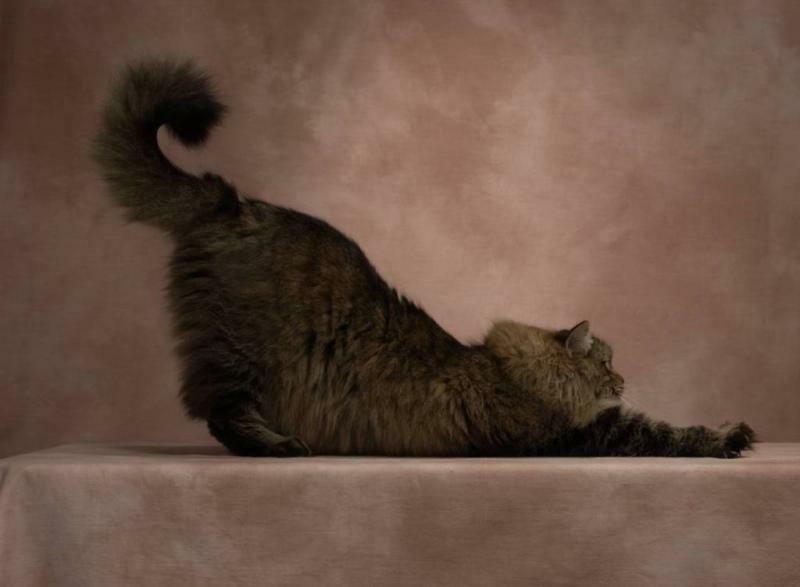 The Siberian Cat is slightly longer than it is tall and has rounded feet and tree trunk legs. The head is rounded with a short, round muzzle and rounded cheek bones not prominently set. Siberians have a flat portion between the ears and a slight curvature from forehead to tip of the nose when viewed in profile.